Sometimes the very thing you're looking for is right under your nose. Take this ladder, for example. It was a little bit country (like Marie Osmond) and too dark for my newly-painted and lightened up family room. So, it was banished to the basement where all of my jewel-toned and dated furnishings have gone to live out their retirement. Well, recently I've felt as if the wall in my family room needed something to jazz it up. 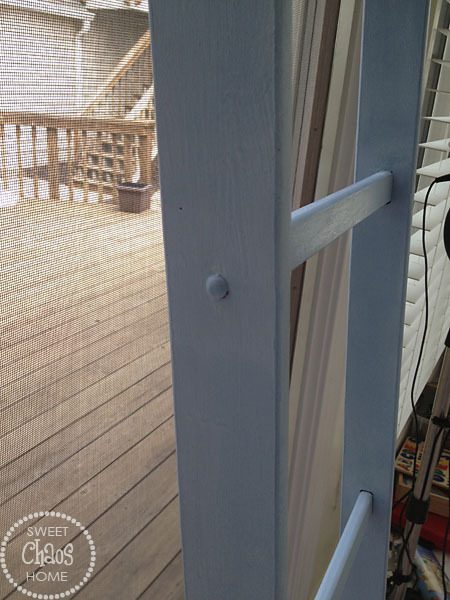 It's a narrow wall between the window and an opening to the sunroom. Hmmm... what would work in that spot? Duh! How about the ladder that used to be there. But this time I'd ditch the quilts and give the ladder a new look. So I broke out a can of chalk paint in "louis blue," and painted it. 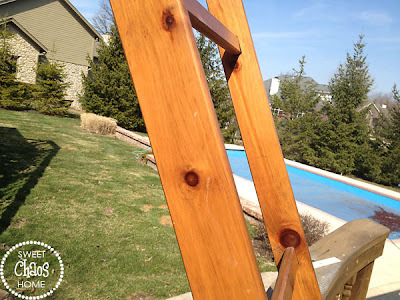 It's rather electric blue when it's first painted, but with some clear and dark wax, the color is toned down. Voila! My wall is no longer empty, my ladder gets to come out of retirement, and the project didn't cost me a dime as I had all the materials on hand. It looks fantastic, Carolyn! I love the color, too. 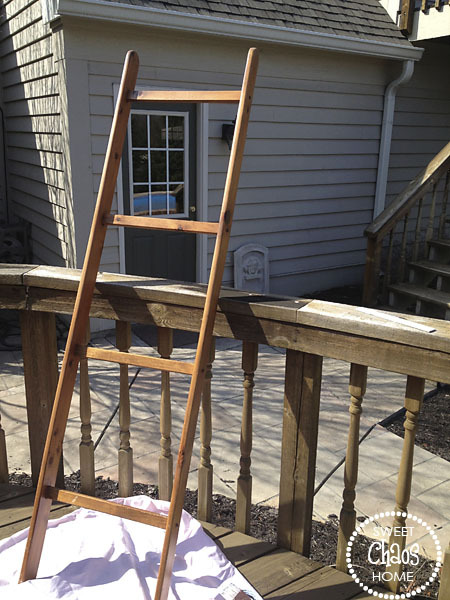 This is the exact size and type of ladder that I want to hang horizontally on my family room wall. I'm going to keep an eye out this summer when I'm up in Michigan, or resort to Ebay! lol! Clever idea, Carolyn! Love the colour! Hi Carolyn, such a fun piece and I'm glad you decided to bring it back with a new look. 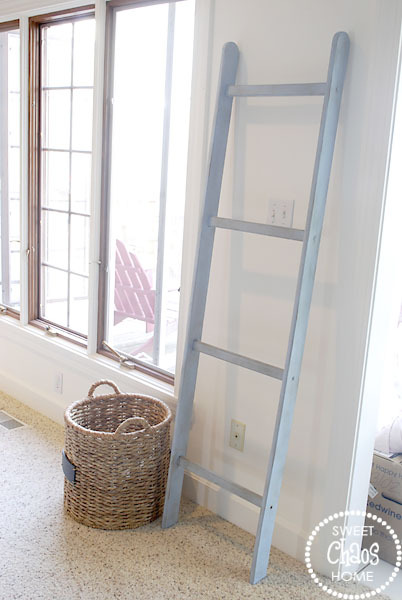 I think ladders are fun room accessories:) I had one in my daughters room and I displayed her ballet point shoes on it. the perfect thing with the perfect color in the perfect place! good job! I found your blog through TDC! Nice to meet a fellow Indiana blogger. 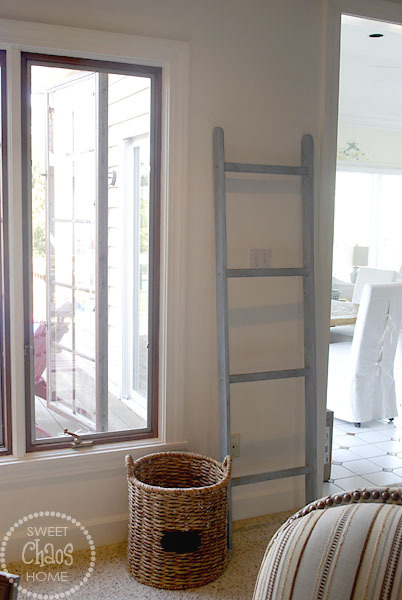 :) I love the ladder by the way and have been drooling over your bathroom. Treasures? I think my husband has another word for them (but I can't use that word here)!! 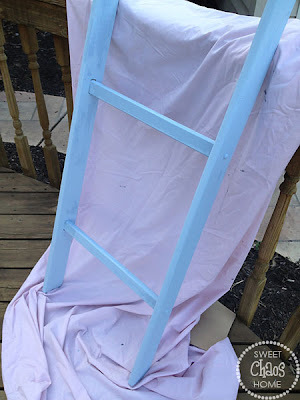 Love that ladder - the color is perfect.